USAF Sheppard AFB Building 825 Renovation - Ahtna Environmental, Inc. USAF Sheppard AFB Building 825 Renovation - Ahtna Environmental, Inc.
Having completed this project 28 days ahead of schedule, Ahtna assisted the Air Education Training Command to mitigate any impact to their training cycles through close coordination and innovative scheduling of construction work. Ahtna was awarded a $1.7M renovations project on board Sheppard AFB to renovate the Bldg. 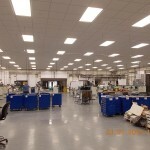 825 Aircraft Structural and Mechanical Training building including machine shop, administrative and training spaces, exterior flatwork, restrooms, and mechanical rooms. We coordinated closely with the facility training staff to avoid impact to the ongoing training mission for Air Force structural and mechanical repair students. 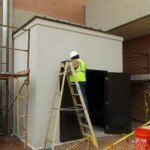 Our work included complete renovation of training spaces, machine shops, welding areas, administrative offices, common areas, restrooms, ADA upgrades, exterior finish work including masonry and concrete, compressed gas cylinder storage areas, new exterior electrical switch gear enclosures, as well as Anti-Terrorism/Force Protection upgrades. Ahtna received multiple commendations from the Base CE staff and AFCEC staff in San Antonio, Texas. In the CCASS rating completed by the Contracting Officer, Ahtna was rated OUTSTANDING in quality control, timely performance, safety compliance, and effectiveness of management.